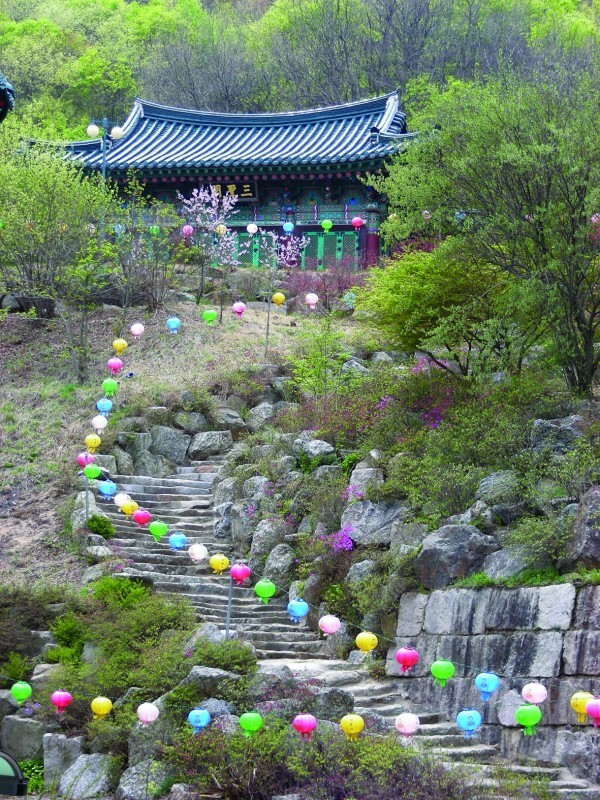 Beomnyumsa Temple of Munsusa Mountain in Cheoinju, Yongin City. 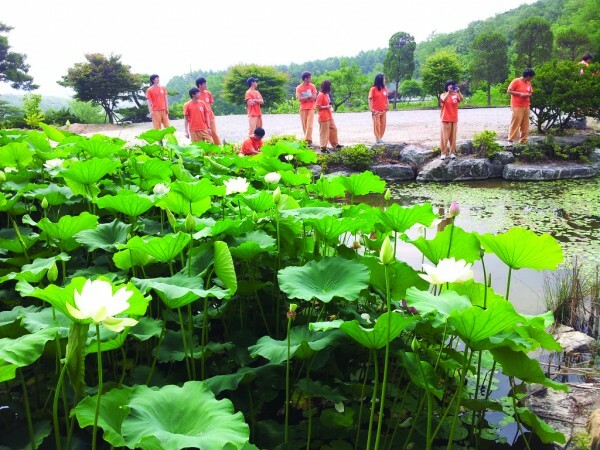 This sacred ground is not only famous as a training center for bhikunis, or nuns, but also for being the birth place of Kwaneum, or the Avalokiteshvara Bodhisattva prayer. 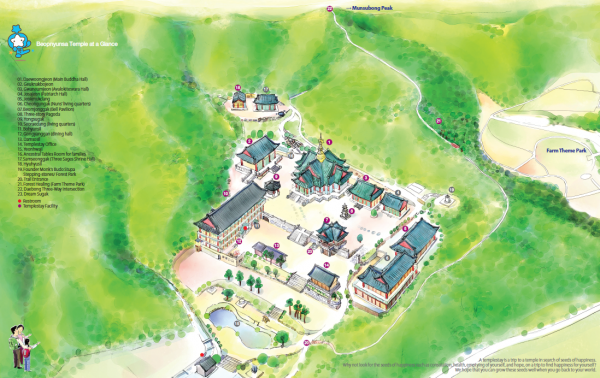 Daewoongjeon, or the Main Buddha Hall, is quite spacious at 429,754 m2, and is shaped like the Chinese letter ‘Ah(亞).’ It was built in the traditional Hanok style. It is said that the hall was designed to convey the wisdom of Buddha, with the hopes that his wisdom would spread infinitely, as a stone thrown in a tranquil pond will cause ripples to spread out. 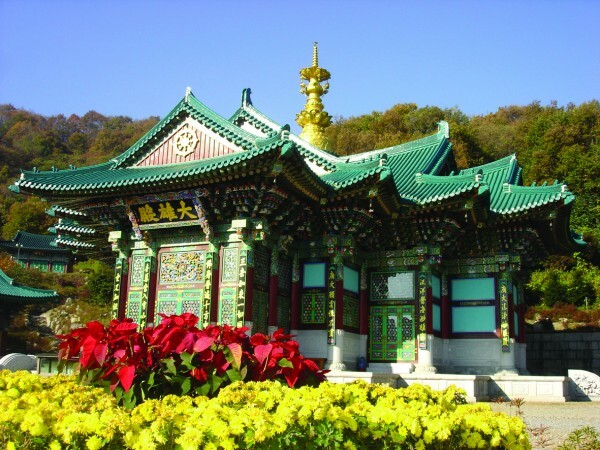 The temple was built from unique red pine trees from Baekdusan Mountain, the highest mountain in North Korea. This type of wood is known for its high quality. The Buddha enshrined in the hall is a statue ofShakyamuni Buddha, made of 53 tons of granite. Since 2014, Venerable Hyunam, the abbess, and the devotees of the temple have vowed to “Live in Buddha’s Way.” Thus, they started their first 1,000-day prayer session, as their first step toward becoming a place filled with such determined practices. This hall was built in the unique shape of the Chinese character ‘Ah(亞)’. It is said that the hall was designed to convey the wisdom of Buddha, with the hopes that his wisdom would spread infinitely, as a stone thrown in a tranquil pond will cause ripples to spread out. Take some quiet time on your own to meditate in the hall, in search of yourself. In the ‘Ah(亞)’ shaped bell pavilion, the dharma bell is struck prior to each yebul, or prayer chant. This is a place for wishing that the resonating sound of the bell will carry one’s dreams into the real world. Before the evening prayer chant, you can participate in the bell-striking ritual. You should arrive 10 minutes before yebul begins. The flowers begin to blossom in summer. It is an excellent place to sit with a new friend, chatting comfortably. Also, there is a lantern lighting event every fourth weekend, where you can see each lantern lighting up, like your dreams. 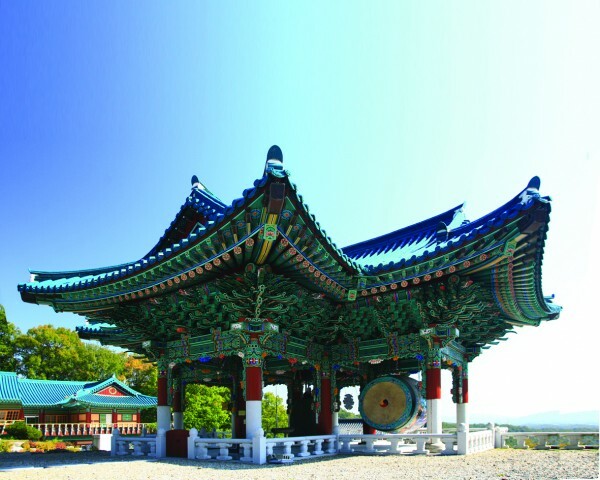 When you get to Samseongak, the whole temple complex comes into view. It is a perfect spot for thinking, as well as listening to the chirping birds and swaying leaves. 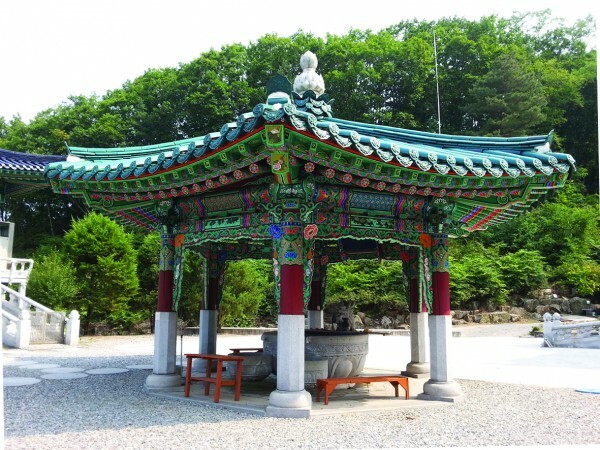 This is the spot where the founder of the temple, Venerable Songryun, dreamed he saw a green dragon spurting blue water. This building was constructed to remember that vision. Since long ago, the fountain there has been known for its mystical power. 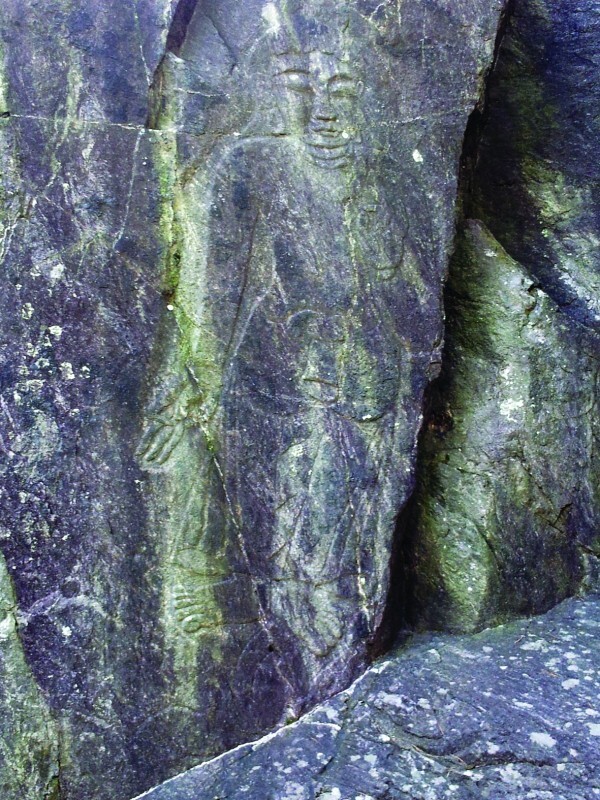 On the bedrock of the old Munsusagi temple site, below the peak of Munsosan Mountain, there are 2.7 meter-high Maaebuls, or bodhisattvas, carved into the stone on both sides. Manjusri, or the Bodhisattva of Wisdom, and Samantabhadra Bodhisattva were believed to have been built during the Goryeo Dynasty. When walking slowly on the path, this course takes about 50 minutes.